Under the slogan "This is how they changed their lives," and under auspices of the Prime Minister, Mohamed Salem Basendwah, the Minister of Social Affairs and Labour, Dr. Amat-Arrazaq Ali Hommad, and Mayor of the Capital Sana'a, Abdul-Qader Hilal. 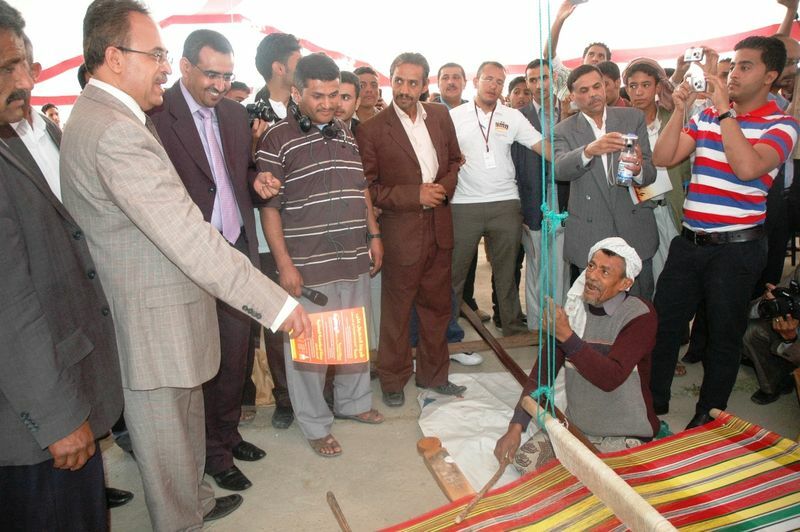 Under the slogan "This is how they changed their lives," and under auspices of the Prime Minister, Mohamed Salem Basendwah, the Minister of Social Affairs and Labour, Dr. Amat-Arrazaq Ali Hommad, and Mayor of the Capital Sana'a, Abdul-Qader Hilal, on Saturday, October 13, 2012, launched activities of the " Small and Micro-Enterprise Week" which is organized by the Yemen Microfinance Network and funded by the Social Fund for Development. In a statement for the Head of the SFD Small and Micro-enterprises Development Unit, Mr. Osama Al-Shami said that this event, which runs until October 19, aims to support the National Microfinance Strategy and promote the wider financial and non-financial services presented by the microfinance institutions (MFIs) which are mostly funded and supervised by the Social Fund for Development. "The event is an open opportunity the clients of those programs and institutions can use to display and sell their products and highlight the success stories of their projects" Al-Shami added. In addition to the clients participation, the events displaying documentaries about the role of the SFD in supporting the microfinance sector and the success of MFIs in targeting poverty and increasing employment opportunities for youth and women as sustainable sources of income generation. He noted that the total loans the SFD-supported MFIs provided to their clients amounted to more than 500 thousand loans exceeding YR35 billion as of August 2012.